With all due respect to the many outstanding 50+ players in soccer hotbeds from North Carolina to northern California, the fellow might have a point. If not the best, the New England Over the Hill Soccer League (NEOTHSL) is probably the biggest and one of the best-organized adult soccer organizations in America. The league, which just finished play in its 30th season, has 230 teams — split into two geographic sections, four age groups and 16 divisions — and a total of 6,400 players, about one-third of whom are 50 and over. It also has a constitution, bylaws, a board of directors, and a 14-page rulebook that covers everything from the length of a game and the type of soccer ball that must be used (two 45-minute halves, no overtime, regulation No. 5 ball) to the exact comportment of a player who is given the boot by the referee (“Ejected persons shall remove themselves to a distance of at least 200 yards from any part of the field”). In short, while they may call themselves Over the Hill, they are very much On Top of Their Game, a game that the older men in this league play with grace, speed, power — and passion, which can sometimes make temperatures run hot despite the fact that many of these guys are grandfathers. And it’s all supposedly for fun. The competitors in this league run the gamut. They are plumbers and physicians; they are Caucasian, African American, Latino and Asian; they come from communities large and small from northern Rhode Island to southern New Hampshire, including Boston and its suburbs. Some have played against Pele as professionals; others kicked their first soccer ball at age 40. Which raises the question: Why all this great soccer here? Since when did Massachusetts become Brazil? “It’s a very interesting sociodemographic story,” says Myles “Dusty” Richard, an Over the Hill veteran, as well as a former professional player and coach for the Brooks School in North Andover, Mass. As Richard explains it, southern Massachusetts — particularly the Portuguese enclaves of New Bedford and Fall River — has had a tradition of strong soccer teams, sponsored by local social clubs, dating back to the mid-20th century. More recently, he says, “you had youth soccer developing in the wealthy Boston suburbs.” The Over the Hill League represents a confluence of these two soccer streams — the mostly blue-collar players from the so-called “ethnic” clubs and the primarily professional white-collar soccer dads. Add in the expatriates from various soccer-loving nations who came to New England to work in the high-tech industry in the 1980s, and you have the Over the Hill League. Considering that most of these men are twice if not three times the age of your typical World Cup player, they played pretty darn well. In short, if you still love the game, get out there and play. 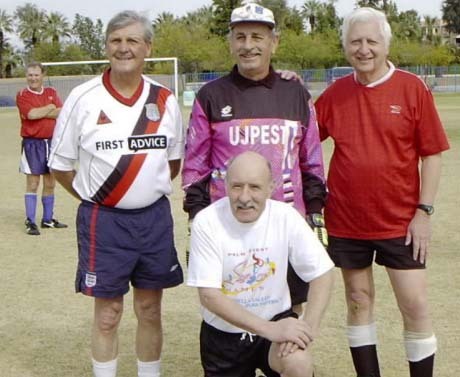 For more information on senior soccer leagues and other organizations in the area check out these websites.